Accessories designer Amanda Testa takes us on a journey deep into the jungle with her eponymous Kingdom accessories range. Completely made by hand, the Sydney-based designer creates her unique handbag collection with captivating fabric appliqués inspired by Art Deco, Art Nouveau, and Orientalist imagery. For her first collaboration with Skarfe, Amanda has recreated three of her beguiling animal motifs on classic hand-rolled silk twill square scarves. 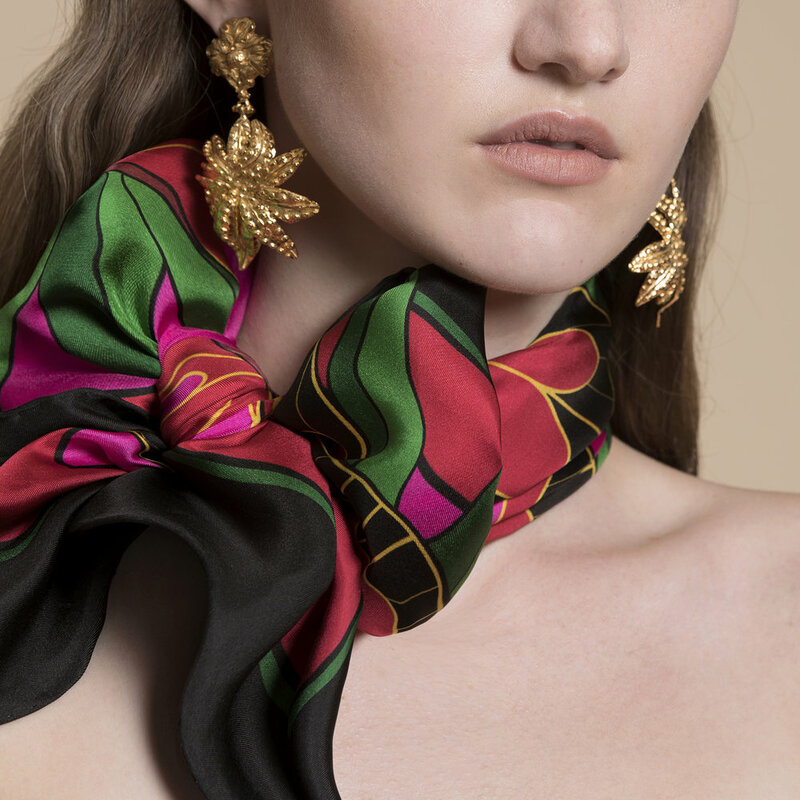 Reminiscent of Henri Rousseau, each scarf comes alive with richly coloured butterflies, gorillas and tigers, peering out from an exotic jungle setting. Amanda Testa for Skarfe is an offering of unique totems and exotic talismans to covet and caress…which spirit animal will you wear? Shop Amanda Testa for Skarfe here! Sydney based fashion and accessories designer Amanda Testa has combined her unique aesthetic flair with her love for lush jungle landscapes in her debut collection Kingdom. Drawing inspiration from post-Impressionist French painter Henri Rousseau’s lush foliage series, Testa has converted friendly, curious jungle creatures into irreverent, hand-appliquéd clutch bags. Each bag is personified through a unique totem and exotic talisman to clutch, carry and covet. Where did your fascination with jungle animals start from? We heard that you drew inspiration from French artist Rousseau, but have you also been inspired by any real-life jungle animals? I've always adored the Rousseau jungle paintings and looked to them for a 'theme' for this collection. His paintings already featured stylised animals, I've just taken it a bit further with the motifs in my designs, making them more stylised. I'd actually developed several other creatures too, but decided an edit of four pieces would make a great debut, choosing animals that were both fierce and beautiful...I quite enjoy the balance of dangerous, playful and pretty. Kingdom is your debut collection - what advice would you give to readers who have been waiting to design their first collection, but haven’t quite been able to figure what aesthetic their brand should embody? Any designer's aesthetic or brand will evolve over time so I wouldn't attempt to nail it down too tightly. I know I personally look forward to exploring all sorts of inspiration in the future! Some of my favourite designers have developed their 'signature' over many years, and what they're known for now is not what they started out doing...the best advice I have, is to gather inspiration, sketch, play with materials, experiment....it all goes into the melting pot of developing your own unique voice. Social media is generally seen as a way of targeting a wide audience. Your brand however seems to be targeted at a very exclusive, niche market. How much do you think social media has helped you to reach your target audience? My pieces aren't intended to attract everyone, so yes those that are drawn to my brand and aesthetic, appreciate and understand it wholeheartedly, and social media will continue to be wonderful for like-minds to seek each other out. Your bags evoke quite a distinct character - if you had to name 3 fashion designers that embody the essence of your products, which would you pick? Schiaparelli, both past and present, Bill Gibb, and a 70's-era Yves Saint Laurent mood is always close to my heart! Shop our edit of the Amanda Testa bag collection here!